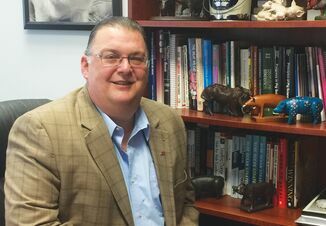 With the recent occurrences of African Swine Fever Virus (ASFV) and Classical Swine Fever Virus (CSFV) in countries important for U.S. trade, there have been many questions about how to best prevent transmission into U.S. swine herds. While feed and ingredients are not the most likely sources of introduction and transmission, they are a documented vector for disease. Thus, the extension of on-farm biosecurity practices to the feed mill is important. What ingredients are at highest risk for ASFV and CSFV transmission? In order to transmit ASFV or CSFV, ingredients need to be contaminated and the virus needs to survive transport in an infectious form. Unfortunately, survivability through transboundary shipment has only been evaluated in a few ingredients, most of which are reported by Dee et al. (2018) in, Survival of viral pathogens in animal feed ingredients under transboundary shipping models. A joint document on Feed Ingredient Safety from the National Pork Board, National Pork Producers Council, American Association of Swine Veterinarians, and Swine Health Information Center includes a decision tree to assess transmission risk in ingredients. Links to references of the research that has been conducted on viral survival and infectivity in ingredients can be found at www.ksuswine.org. Most of the ingredients tested can retain ASFV (soybean meal, choline, and dog and cat food), while none retained bovine viral diarrhea virus, the surrogate for CSFV. However, the ability for ASFV or CSFV to survive transboundary conveyance in many common swine ingredients remains unknown, including corn, wheat middlings, fish meal, porcine-based ingredients, whey, trace mineral premixes, or synthetic amino acids. 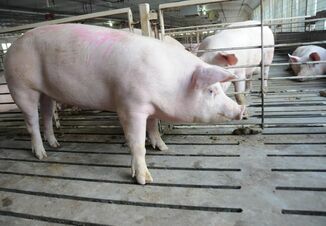 Of the data available, the ingredients commonly used in swine diets and showing an affinity for survival of viruses such as porcine epidemic diarrhea virus (PEDV) and foreign animal diseases include: soybean meal, DDGS, porcine-based proteins, vitamin premix, choline chloride, L-Lys, and DL-Met. 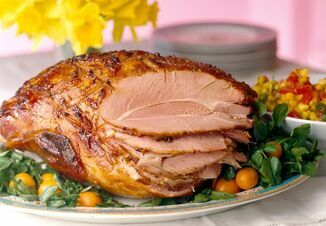 To help make assertions about ingredients that have not yet been evaluated, it seems that ingredients are more likely to promote virus survival if they meet one of the following criteria: high in protein (especially natural protein), porcine-based, relatively large surface area:mass ratio, and micro ingredients with carriers. Notably, not all of these are likely to have the same contamination risk. For example, ASFV is unlikely to survive the fermentation process for synthetic amino acids and if packaged in a closed system with single use bags or totes, we hypothesize the risk is negligible. However, those transported in bulk or sprayed on carriers may have a higher risk of becoming a vector if the practice occurs in an ASFV- or CSFV-positive country. Rice hulls or corn cobs used as premix carriers from ASFV- or CSFV-positive countries are viewed as a higher risk for contamination with ASFV or CSFV than concentrated synthetic amino acids packaged in sealed bags from the same country of origin because of commonly used agricultural and transportation practices, plus the higher likelihood of exposure to or origination from infected farms. What dose of ASFV or CSFV is needed in feed to cause infectivity in an animal? Previous research has determined the minimum or median infectious dose of ASFV in different isolates to be between 102 and 105, depending upon virulence, frequency of exposure, and method of introduction. However, infectious dose in feed has not yet been reported for the ASFV Georgia isolate that is circulating in China. Research is currently ongoing to establish the minimum and median infectious doses in pigs through natural consumption of feed. Likewise, there is little reported data on CSFV infectious dose from feed or ingredients. Compared to PEDV, which had an infectious dose in feed of 101, why is ASFV such a concern for ingredient transmission? The two viruses are very different. While PEDV is more infectious in feed, it is more susceptible to loss of infectivity. Meanwhile, ASFV is a very hardy virus that has extensive survival across a broad range of temperatures and pH values. Virus can survive for up to 11 days in feces and 150 days in boned meat. The extensive length of infectivity and stability in various environmental conditions makes ASFV particularly susceptible for feed-based transmission. In addition to dosage, can the number of exposures have an impact on transmission? Basic infections disease epidemiology assumes exposures are independent events and that multiple exposures increase the risk of infection. For example, if a single pig has a probability of infection from a single exposure of 0.20 the probability of infection from 3 exposures of the same dose is 0.49. It is easy to assume that exposure via feed will not be a single exposure since the pigs will eat multiple meals each and every day, consequently probability of infection will be greater than predicted via experimental data. Can I analyze feed or ingredients for ASFV or CSFV? Currently, U.S. veterinary diagnostic laboratories do not analyze feed or ingredients for ASFV or CSFV. In the absence of diagnostic capabilities for ASFV or CSFV in feed, the best alternative is to assess ingredient hygiene for Enterobacteriaceae. This is a family of bacteria, which includes both nonpathogenic and pathogenic genera, including Salmonella and E. coli. Research has demonstrated that the presence of Enterobacteriaceae is indicative of overall hygiene. This surveillance method is commonly applied in the human food and pet food industries, but is just beginning to see application in livestock diets. For further information about sampling technique and laboratory submission directions, see www.ksuswine.org. Should we stop importing or using all ingredients from China? It is appropriate to consider excluding high risk ingredients that are likely to be contaminated with foreign animal diseases, but this recommendation extends beyond China. For example, ASFV cases have been noted in several Eastern European countries. That said, current supply chain constraints may limit producers’ ability to shift the entire industry away from Chinese- or Asian-based ingredients, and it may not be necessary if the ingredient is unlikely to be contaminated. Address the decision tree in Figure 1 and have conversations with your feed or ingredient supplier about the safety of your ingredients. Some of these questions are outlined in the Feed Ingredient Safety document found here: https://www.swinehealth.org/wp-content/uploads/2018/09/Feed-Ingredient-Safety.pdf. Both PEDV and ASFV show affinity for survival in porcine-based ingredients; however, the mechanism for this is still somewhat unknown. Based on the knowledge we learned when dealing with PEDV, the availability of alternative ingredients led many producers to shift away from porcine-based ingredients with little to no impact on animal performance or feed cost. Research has demonstrated the ability of thermal processes to destroy viruses, such as PEDV, but this is a point-in-time mitigation strategy that requires the product to be protected from subsequent cross-contamination during drying and transportation. If a producer determines exclusion is appropriate, he/she should also consider nonobvious sources of porcine-based ingredients, such as add-packs, base mixes, and other animal protein or fat sources that may come into contact with porcine-based sources. If a producer chooses to use porcine-based ingredients, biosecurity and prevention of post-processing cross-contamination become a key factor in its risk assessment. Can mitigation measures of PEDV be applied to prevent ASFV or CSFV transmission in feed? The swine industry learned a great deal about prevention of PEDV through feed and ingredients over the past 5 years. The lessons in biosecurity to limit spread from vehicles and people apply to other viruses, and these can be applied to foreign ingredient suppliers to prevent foreign animal disease transmission through ingredients. However, the PEDV-derived information that demonstrates susceptibility to irradiation, thermal processing, or chemical application cannot be directly applied to other viruses. How long should I quarantine high risk ingredients from ASFV- or CSFV- positive countries? At the current time, there is insufficient data to confidently use quarantine time as a mitigation measure. The Dee et al. (2018) research included half-life estimates of the ingredients that retained viral infectivity after transboundary shipment. These estimates are based on initial (d 0) and end point (d 30 or 37) titers. There are no half-life estimates for CSFV because the surrogate for the virus had no measurable titer in any ingredient after 37 d.
The results of these estimates must be applied with caution due to the few number of replicates (2 samples/ingredient), level of inoculum (105 TCID50), and extremely small size of the samples (5 g). Furthermore, these values were determined based on only two time points. Most importantly, it is inappropriate to assume a linear decline in ASFV to determine quarantine time. Research has established that PEDV survival differs among feed ingredients and at varying rates in a quadratic, not linear, pattern. For example, Figure 2 shows the quantity of detectable PEDV over a 42-day period in three ingredients and a complete diet as reported by Cochrane et al. (2016). The graph on the left shows the initial (d 0) and final (d 42) quantity of PEDV. There is a known minimum infectious dose for PEDV in a complete diet, which is equivalent to a Ct of 37 as measured by RT-qPCR and shown by the blue arrow. If we were to fit a line and use it to estimate quarantine time, our estimate would be that the quantity of detectable PEDV would be reduced to a level beyond the minimum infectious dose (37 Ct) after 60 days in the complete diet and after 185 days in porcine meat and bone meal. This alone is a risky determination, because we do not know the minimum infectious dose in the porcine meat and bone meal. In reality, the research included intermediate sampling dates, so the graph on the right shows the quantity of detectable PEDV on d 0, 1, 3, 7, 14, 21, and 42. This helps demonstrate that the PEDV RNA is relatively stable in the porcine-based products, but shows a quadratic decline in the complete diet and avian blood meal. When theoretic calculations are applied to extrapolate the data beyond d 42, the lines for the tested products never reach the minimum infectious dose. This concept helps demonstrate the potential for inaccurate assumptions when calculating quarantine times based on two time points. The viability of ASFV in ingredients after 30 d remains unknown, and there is insufficient data to accurately estimate it. Until more research is reported, high risk ingredients should be sourced from ASFV- and CSFV-free countries as realistic quarantine recommendations cannot yet be calculated. Do formaldehyde-based products prevent ASFV or CSFV transmission? There is no available data to make this determination. Its proposed mode of action, through irreversible cross-linkages of proteins, are likely to also affect proteins in ASFV and CSFV, but this has not been confirmed. Compared to PEDV, ASFV is much more environmentally stable across a wider pH range; which may affect the efficacy of formaldehyde-based products for ASFV compared to PEDV. According to the OIE, formalin (3/1000 for 30 minutes) is an effective sanitizer of ASFV, showing that formaldehyde-based products may have potential as ASFV mitigants in feed. Two formaldehyde-based products, Sal CURB (Kemin Industries) and Termin-8 (Anitox) are available in the United States, but both are only labeled for prevention of Salmonella spp. Do medium chain fatty acid (MCFA)-based products prevent ASFV or CSFV transmission? There is no available data to make this determination. The hypothesized mode of action of MCFA, to create pores in the PEDV membrane that lead to viral instability, may be similar in ASFV and CSFV as they are also enveloped viruses. Research is ongoing in this area. With all this “we don’t know,” what can swine producers and feed mills do to prevent ASFV and CSFV? First, it is important to truly understand the supply chain of ingredients you utilize. From whom do you purchase Ingredient A? Where do they get it? Does it get blended or mixed with other ingredients along the way? What are the biosecurity policies at each of those locations? These conversations are important to have in order to properly assess ingredient risk for carrying foreign animal diseases. A biosecurity audit is posted on www.ksuswine.org to help facilities have conversations about potential actions they can take to improve biosecurity. If you ask your supplier to increase biosecurity or exclude some ingredients, understand that it will most likely be associated with a higher cost. In your facility, be diligent with feed mill biosecurity. Cover receiving pits when not in use, effectively control pests, prevent the inclusion of dust from dust collection systems recycled back into diets, and manage personnel movement throughout the mill. Many references on feed mill biosecurity can be found at www.ksuswine.org. Finally, consider monitoring your environment for biosecurity compliance. Environmental monitoring has become routine in human food and pet food industries, and can help identify weak points in biosecurity plans. For further information about swabbing technique and laboratory submission directions, see www.ksuswine.org.